All of our walking tours of Bay Ridge! Listen in and learn about your neighborhood. Our first audio walking tour. Start at 67th Street and Colonial Road. Why the heck is it actually called Owl’s Head? Find out! Today we partnered with Hey Ridge editor and local historian Henry Stewart to bring you an Owl’s Head Park walking tour. In fact, we think it’s actually the first audio walking tour of Bay Ridge… ever! This 15-minute guided episode is meant to be played on-site at Owl’s Head, at the entrance on 67th Street and Colonial Road. 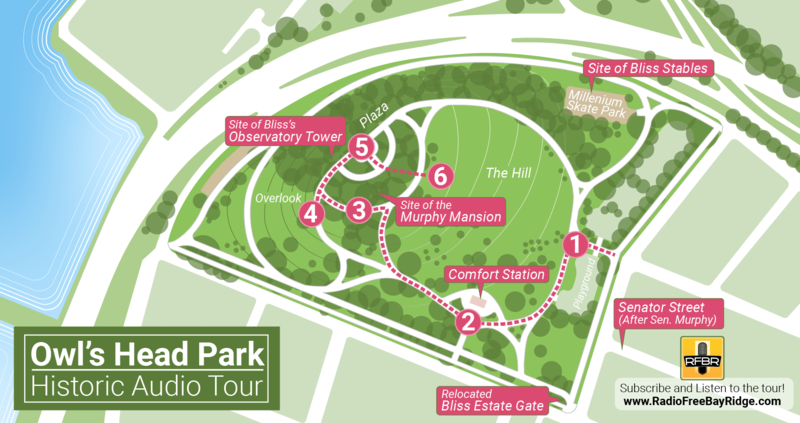 You’ll explore the history of the park, from the pre-colonial era up until today. We’ll separate the myth from the fact about the name “Owl’s Head”, of course. But did you know the origins of the nearby street names? Do you know who exactly Senator Street named after? Together we’ll walk past where once a grand mansion and castle-like tower once stood, as well as learn about the odd tastes of the man who occupied the grounds. There’s weapons arsenals, gangland shootings, tragic deaths, and development deals gone sour. Henry will also discuss the original designs for the park and what was lost to time. Most importantly, we’ll be out enjoying one of Bay Ridge’s most beautiful parks! Let us know what you think about the episode, and whether we should do more of them! And in case you don’t get Radio Free Bay Ridge on your phone, be sure to check out the subscription links below.